Another in-between day. Martin Luther King day is a bank holiday here. We’re taking the progeny to see “Tintin” in 3D. At the moment it is about 25°F and in my opinion that warrants a cashmere rollneck, suede overshirt, merino tweed trousers and suede chukkas. All topped off with a camelhair polo coat, scarf and gloves. It seems that I like monochromaatic dressing when in-between. Hmmmm. 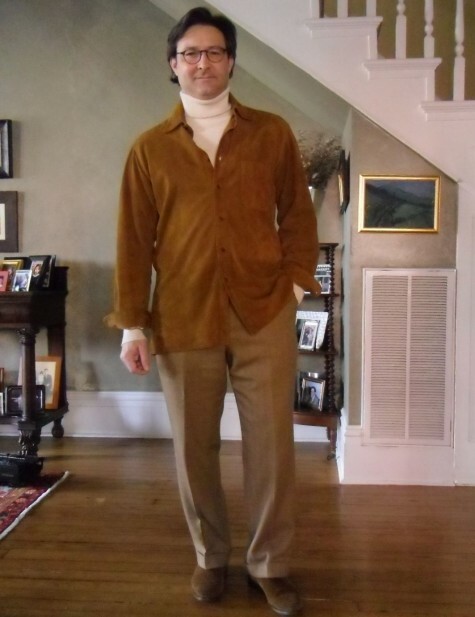 This entry was posted in Elegantology and tagged cashmere turtlenecks, in-between dressing, MLK day, momchromatic dressing, suede chukkas, suede shirts. Bookmark the permalink.